Free Packing Materials with any move! The kids are settled back in school, the heater has kicked on, and the holidays are just around the corner—winter is here, and while this may mean hunkering down in the comfort of a warm home for some, for others it means taking advantage of the winter months to move to a brand-new home. Winter is the offseason for moving companies, but it is still important to plan well in advance. When scheduling your move, discuss alternative dates with your moving provider as well. This gives you a Plan B if the weather decides not to cooperate on your moving day. When living in Maryland or Virginia, the weather can go from cool and comfortable to snowy and freezing quickly. In the days leading up to your move, keep an eye on the forecast so you can plan in advance. If a major storm is coming, call your mover ahead of time to get a plan in place if conditions are too poor to complete the move. Get your new home ready for your arrival by calling in advance to ensure the utilities are all turned on. You’ll also want to make sure that your new and current home have fully cleared driveways, pathways, and steps! To protect your current home on the big day from snow and mud being tracked through the house, cover your flooring with a drop cloth before the movers arrive. Temperatures could easily be in the single digits (or colder!) when moving on a winter day, so you need to make sure that you dress for the occasion. Dress in layers so that you stay warm in the early morning hours and can easily adjust by removing layers as the loading process begins. It’s also smart to set-up a warming station for you, your family, and your moving team with hot beverages, space heaters, and water. The winter season means more than just cold weather—it means that it gets dark outside far earlier! 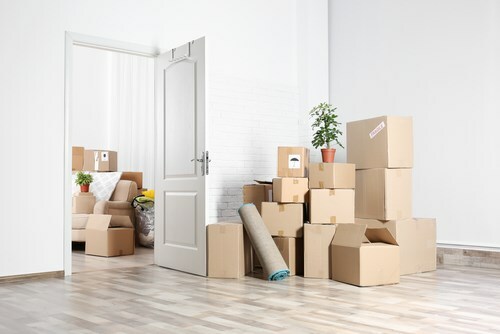 To keep your move on-schedule and to avoid hauling and loading boxes in the dark, have everything ready to go at your home for your moving team. The earlier you get started, the sooner you can be warming up in your new home! From moving and storage to packing and unloading, 495 Movers offers comprehensive services for all of your household moving needs—even when you need to move in the coldest months of the year! If you’re ready to start planning your off-season move, give us a call today or fill out our online form. We can fill you in on the details of what we offer, and get you set up with a free quote and in-home consultation. What Packing Materials Do I Need for a Move? What Do I Need for Moving Out of State? © 2012 - 2019. All Rights Reserved. 495 Movers Inc.